To ensure you achieve your specific goals, our Physiotherapists will assess you and develop an individualised Clinical Exercise program for you. Our experienced Physiotherapists will work with you one on one (30 or 40 minute sessions) to refine your exercise program, and build your confidence on the specialised equipment. 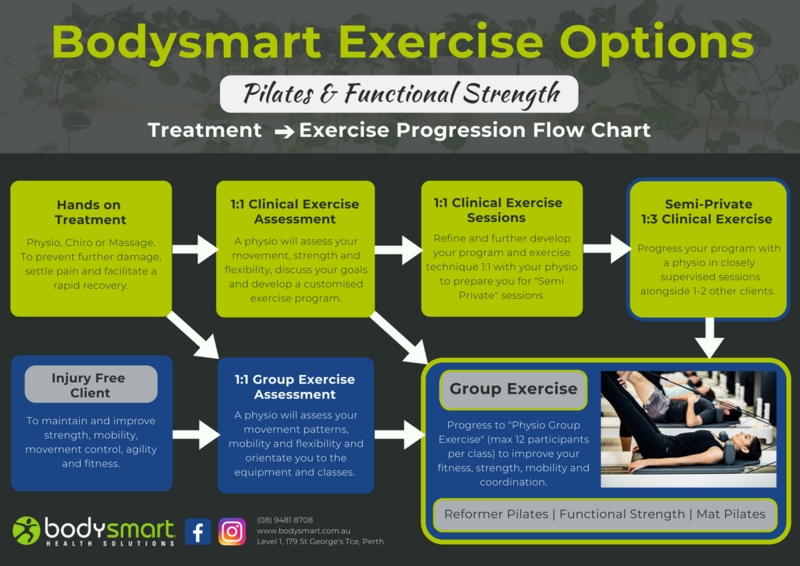 This will improve your confidence and exercise ability as we continue to refine and develop your unique Clinical Exercise program. You can continue at this level or progress to semi-private sessions. Continue to progress your individualised program with your Physiotherapist in a semi private setting. Each session will be specifically customised to your needs and progressed as you progress. Ready to progress further? Bodysmart also offers larger format Group Reformer at our Perth CBD location. Book an appointment online, contact us or give us a call on 94818708 to Live Your Potential!